isignfund is a unique Crowdfunding platform for all your needs. You can raise a petition and better yet fund it to support the expenses. Invite Organizations to show their support with social and reporting tools. Create Personal, Animal support, Medical bills, Business crowd funding with and without rewards. You can create a Survey or Quiz and send to your audience at no cost up to 200 responses. Your Fundraising platform that pay you and your friends back for helping others to raise funds for personal and emergency needs. We pay up to 3% in total for both referrer n fundraiser for referrals. Register today using below link and help us to help you more. Please share your link after registering. They have new and exciting things coming up for more incentives even in Bitcoin world. So don't miss on registering. Article on PERFOCOIN ICO is featured in ICOCROWD Magazine. 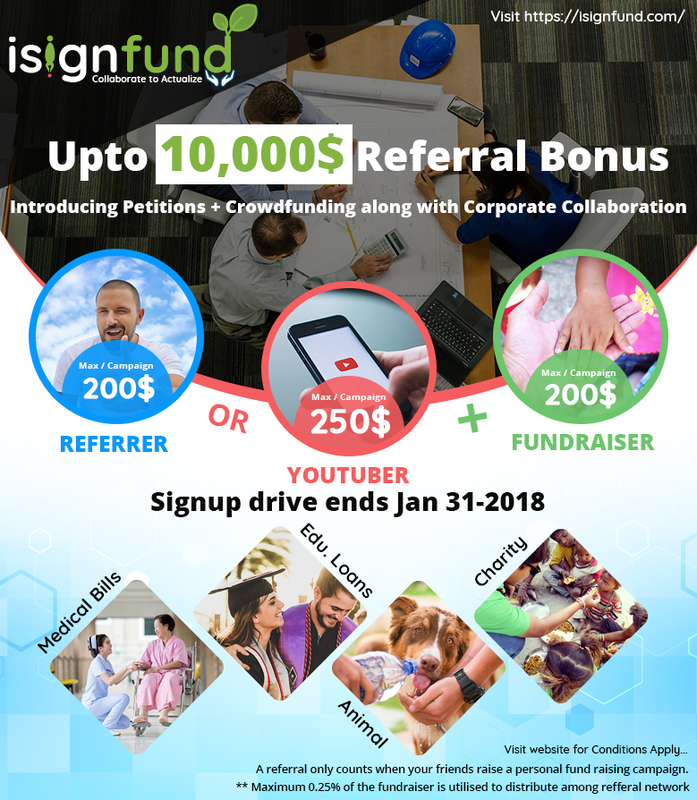 Owner of the company siva vangala is a strong believer of CryptoCurrency and would like to utilize his teams experience in HR Recruitment and Crowd Funding space to be utilized as reward based system using tokens.He is busy in making our new product #isignfund a success. He will be launching our ICO in early January. This is Ultimate site for all contests,Traveling tips,Social media Tricks,Reviews and entertainment etc.Our goal is provide all the genuine information as quickly as possible to our site users. HI this is pralaya simha from andhrapradesh. I mad about social media, blogging,photography etc..